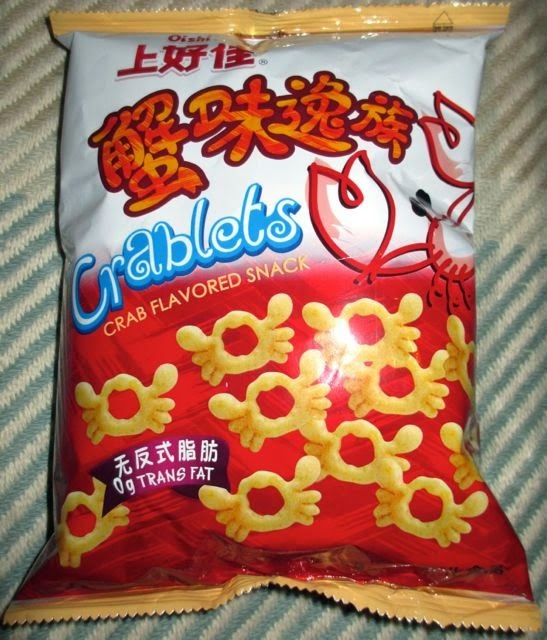 These Crablets, which are crab flavoured snacks looked so cute on the front of the bag that I just had to buy them to gobble them up. I do like fishy treats and I haven't seen crab flavoured (or shaped) crisps before. The only fishy meals I haven't liked in the past are lobster and mussels. I've tried lobster twice on two different occasions in two different restaurants just to make sure I really didn't like it. The mussels were a starter in a restaurant in Wales where they literally gave me fifty mussels in a cream filled hollowed bread-bowl. After five mussels I started to feel ill. Fortunately Cinabar loves lobster and also mussels, so we swapped on those occasions! Anyway, I digress... There was a hint of something chemically on opening the packet (maybe in my mind from reading the ingredients, but I was sure it was there), but that was soon replaced by a good strong shrimp and crabmeat smell with an added wheatiness from the snacks. 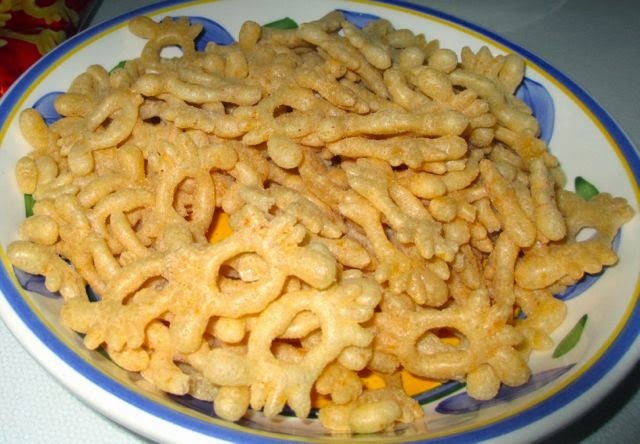 The crunchy crab shaped snacks had a wheat and shrimp flavour to start with and then an explosion in the mouth of crabmeat. I found these crab flavoured snacks very tasty and there were oodles of them in the packet. A great snack alternative to the usual prawn cocktail crisps on the market. You don't necessarily need to dip these Crablets as they were tasty on their own. However there's no excuse not to dip them in Mary Rose Sauce if you have some in the fridge, otherwise I found Salad Cream almost just as good! Produced by Oishi, in China. 40g bag, at 30g at 142 calories, with 6.3g fat and 2.1g of sugar. Ingredients included; wheat flour, vegetable oil, starch, crab powder, garlic powder, sugar, salt, onion powder, soy sauce, artificial flavours, spices, yeast extract, (and here's some of the crazy laboratory stuff) food additives; carotene, calcium carbonate, silicon dioxide, (it gets weirder) disodium 5'-ribonucleotide, and glycerol monostearate. Allergen information; wheat, soybean and crustaceans; crab and shrimp. Not suitable for vegetarians.